Podcast Episode 46 is holiday-centric version of our patented Recorded Live Readings. (Q: "If they're recorded, then how can they be live?" A: "Come over here and ask me that again.") 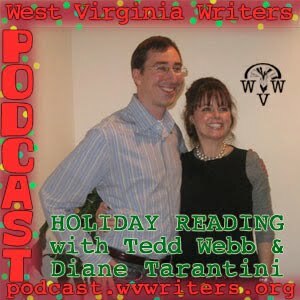 The readers for this event were Ted Webb and Diane Tarantini and it was recorded on November 5, 2010 at the Zenclay Gallery in Morgantown. Ted Webb is a cofounder of Morgantown Poets. Diane Tarantini is a member of WV Writers and won four awards in our 2010 Annual Writing Competition. Together, they put on a holiday reading full of humorous essays and poetry.